Behind every myth, fairy tale, and legend—hidden within the art, song, and structures of ancient times—is an encoded layer of wisdom, science, and truth passed down throughout history. 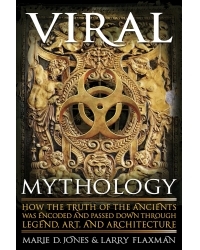 This book will examine how information went “viral” long before the Internet, and served as the foundation for mythology, sacred architecture, and symbolic imagery throughout the ancient world. From the great myths of the Greek, Roman, and Norse to the texts of the world’s major religions, from folklore and fairy tales of old to sacred edifices and monuments, from cave paintings to the mysterious symbology of the Tarot, Viral Mythology uncovers the information highway of the past, and explores how it affects the more modern methods of communication today. Marie D. Jones and Larry Flaxman are the best-selling authors of 11:11 The Time Prompt Phenomenon; The Trinity Secret; This Book Is From the Future; and The Déjà vu Enigma. They are also screenwriters, researchers, and popular public speakers who have been interviewed on television and radio shows all over the world, including the Discovery Channel, the History Channel, and Coast to Coast AM Radio. They are currently staff writers for Intrepid Magazine, and regular contributors to TAPS ParaMagazine and New Dawn Magazine. They can be reached at www.paraexplorers.com.